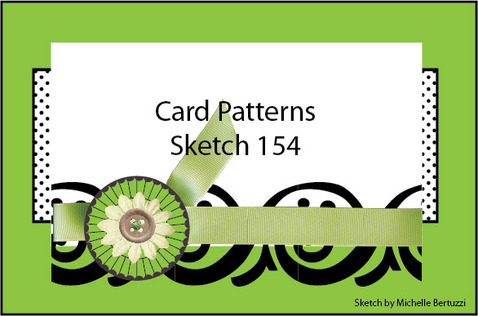 It's time for a new sketch at Card Patterns, this week we're sponsored by My Favorite Things. Each team member was given a gift voucher to purchase some stamps with to use on their cards this week. Here's this week's great sketch! I flipped it on it's side for my card. I'm loving yellow at the moment, I don't know why but I'm just going with it. If you know me at all you'll know how much I love cameos and silhouettes so when I saw this fabulous stamp set at My Favorite Things I knew it was the one for me! It's Vintage Cameo Stamp Set, there's also a matching die for one of the frames, not this one, I fussy cut this! I really liked the crackle effect stamp that you can use in the stamped frame, I stamped this with Distress Ink Vintage Photo. 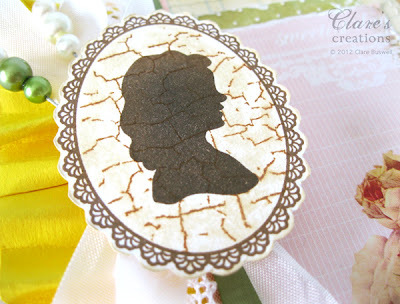 The silhouette is stamped with Coffee Archival Ink. The pearl trinket pins I made, the light cream ones are in my Etsy shop. I'll be adding some of the green ones soon. The sentiment is from the same Vintage Cameo Stamp Set from My Favorite Things. The green paper I embossed using the Swiss Dots embossing folder. 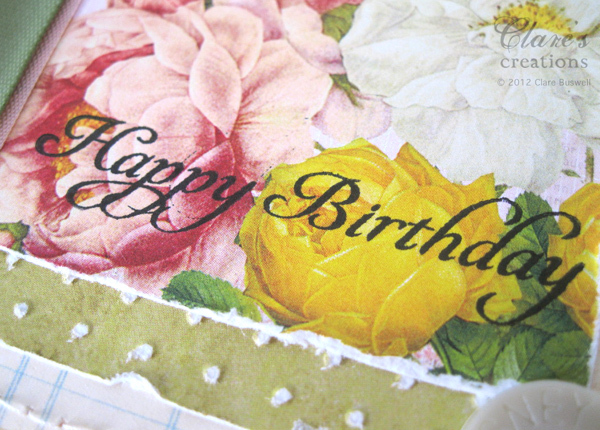 The paper is an old one from Pink Paislee, Sweetness Collection. 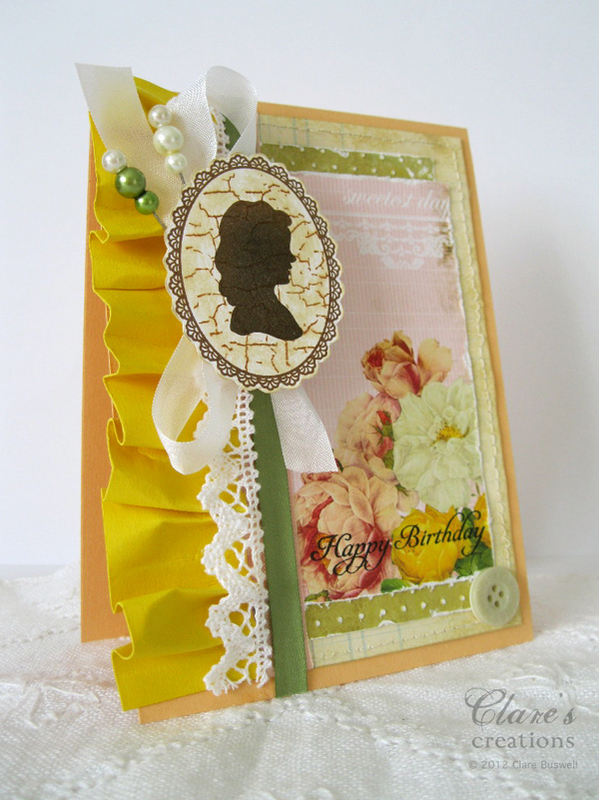 Picking up the yellow in the patterned paper, I used a strip of yellow cardstock to make a paper ruffle. See my tutorial for the paper ruffle here. 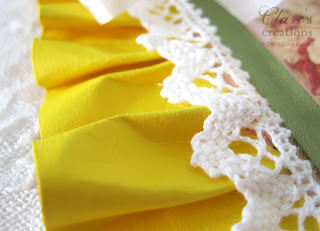 The white crochet lace is from Wild Orchid Crafts and the Willow Green Twill is from the Craft Fairy. 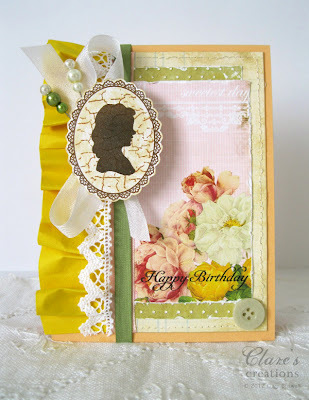 Labels: Cameo, Card Patterns, My Favorite Things, Silhouette. So very pretty! The colors say 'Spring Time' to me. And I do love the stamp that made the crackle effect look. This is so beautiful Clare!